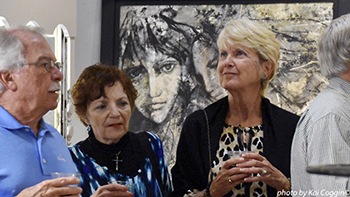 A continuous tradition since August of 1989, fine art galleries and studio spaces in downtown Hot Springs stay open late for Gallery Walk on the first Friday of each month to host openings of new exhibits featuring work by local, regional, national and international artists. Hot Springs’ fine art galleries offer a wide range of original art for every taste. Exhibiting art by local, regional, and national artists. Two floors, over 4,000 sq. ft. of fine art. Gallery II: Thomas Kinkade Showcase Gallery. Hours: Mon. – Sat., 10-5. A fine art cooperative exhibiting original works of 30 local artists. Featuring traditional paintings to contemporary abstracts, pottery, jewelry, fused glass, miniature paintings, scarves, woodturning, sculpture, and photography. Established 1990. Hours: Mon. – Sat., 10-5; Sun. 12-5. Featuring internationally recognized artist Daniel Mark Cassity, named an “Artist to Watch” by Southwest Art Magazine, along with showcasing 35 outstanding artists, from impressionists to contemporary acrylics and oils, pottery, blown glass chandeliers, and sculptures. Hours: Mon. – Sat., 10-5. Justus Fine Art Gallery features the original work of respected artists including: Kari Albright, Michael Ashley, Dustyn Bork, Beverly Buys, Taimur Cleary, Donnie Copeland, Kristin DeGeorge, Virmarie DePoyster, Mike Elsass, Robert Fogel, Jennifer Libby-Fay, Randall M. Good, Matthew Hasty, Jeri Hillis, Robyn Horn, Don House, Dolores Justus, Jill Kyong, John P. Lasater IV, Gerri Much, Charles Peer, Sammy Peters, Laura Raborn, Jason Sacran, Tony Saladino, Sandra Sell, Gary Simmons, Gene Sparling, Rebecca Thompson, Dan Thornhill, Emily Wood, and others. Paintings, sculpture, ceramics, photography, jewelry, and more are offered. New exhibits are hung monthly. Hours: Wed. – Sat., 10-5 and by appointment. A museum art/humanities gallery at the Henderson State University’s Hot Springs campus. The 2019 exhibits include: Limited Editions – AR Society of Printmakers, Next Generation – figurative and portraiture of youth, Latino Art Project – artwork by Hispanic and Latino Arkansans, and Hot Water — a Hot Springs National Park exhibit. Hours: Mon.- Fri., from 9 am – 4 pm, and by appointment on Sat. and Sun., (501) 545-0534. Open Gallery Walk until 8 pm. Legacy Fine Art Gallery is a completely renovated gallery featuring incredible works by local, national, and international artists such as Carole Katchen, Byron Taylor, Ed Pennebaker, Vangelis, Desjardins, and many more. Open during Gallery Walk and by appointment. Featuring Palmer’s colored pencil drawings and oil paintings. Limited edition archival prints from her Arkansas Champion Trees series and notecard series are also available. Signed copies of her recent book, The Champion Trees of Arkansas: An Artist’s Journey can be ordered on her website or purchased at Gallery Central. Studio is open for visits when the artist is in the studio or by appointment. Whittington Gallery & Studios is a laid back gallery exhibiting the work of 38 local artists in a 5,000 sq. ft. gallery space. Featuring oil and acrylic paintings, pastels, watercolor, pottery, jewelry, wooden bowls, photography, and more. Hours: Mon. – Fri.,9-3; Sat. from 10-4.